I received this machine: Fountain jet stater kit Which is on sale for $99. The website lists 3 color choices to choose from, Black, White, or Red. I received the Black/Gray fountain jet which is perfect decor for my kitchen since my stove, microwave and refrigerator is black/gray. The best feature of this machine is that there is no power involved! Have an electricity outage? A family gathering? Or just thirsty? No problem! The machine doesn't plug into an outlet, nor does it take batteries! It works with a quick push of the button and very easy to put together and use. Clean up? No clean up necessary when using the machine! Seriously, none. The only clean up is your bottles after use. The Fountain Jet Soda Maker can make up to 110 liters of carbonated water offering you great savings compared to pre-packed carbonated water and beverages. Turn tap water into sparkling water in 30 seconds with the Fountain Jet Soda Maker. The Fountain Jet fits the extra large 110-liter carbonator and includes an easy to clean drip tray and customizable carbonation levels. Basically, all you have to do is fill up the bottle to the water line with regular tap or bottled water, screw the bottle onto the machine and push the button located on the top 3 times to carbonate the water. Remove the bottle of carbonated water and add your flavoring mix. Apply the cap and gently shake the bottle until liquid is mixed and then enjoy! Quite simple. 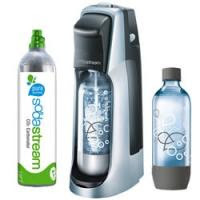 Ordering exchange carbonators requires that you currently have an equal number of empty carbonators to return to SodaStream. Failure to return an equal amount of empty carbonators for the number of exchange carbonators you ordered will result in a $15 User License Fee per carbonator. The cost to refill the carbonator included in the kit is $21.99 but, well worth it when knowing that you could make SEVERAL liters of soda! Be sure to read the instructions in your manual before putting your kit together. I've had the pleasure of trying the Root Beer-$4.99 today. This product tastes great! 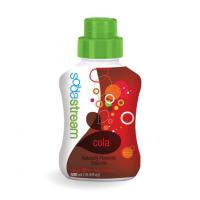 I had no idea that you could create a delicious soda on your own and less expensive than store bought soda. There are so many Flavors listed on the website to try! I cannot wait to order more flavors once I finish the mixes I already have in hand...I might not wait until they are finished! 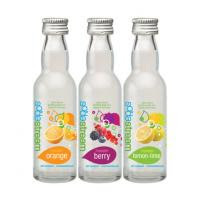 SodaStream USA also included the My water variety pack ($7.99) which includes Orange, Lemon Lime, and Berry flavorings. MyWater Variety is unsweetened and an all-natural flavor essence for making lightly flavored seltzer or sparkling water. Each 40ml (1.35 fl oz) bottle makes around 20 liters of flavored sparkling water and comes in a pack of 3. Serving suggestion: Add about ½ teaspoon of MyWater to one liter of sparkling or still water. Adjust to taste. Refrigerate after opening. Consume within two months of opening. Sounds great, right? I'm sure it would taste great when flavoring regular bottled water for on the go as well. Just slip it into your purse or lunch bag (If you have a place to chill the bottle once opened) and flavor your water anywhere, anytime! I opened the bottle of orange mix and the citrus scent is amazing. I slipped a little in my water and it's not too overpowering. I love how water can be "spruced up" and less boring, don't you? Whatever your needs might be, they have a soda maker that is right for you! I decided to try the Fountain jet as it seems to be the most popular design as well as easier on the budget during the economy crisis. If you choose to purchase a kit, please let me know what flavors you chose to try out and how they tasted so that I know what to try next time! I have not and will not be paid for this review. I was generously sent the products to try and share my opinions with my readers. This is an old review. Not sure why it updated to a new post.